The amount of weight women gain during pregnancy varies greatly. It may range from weight loss to a total gain of 50 pounds or more, so it’s difficult to set one figure as an “ideal” weight gain during pregnancy. But experts agree—gain the recommended weight during pregnancy to have a healthier pregnancy. How much weight you gain is influenced by your prepregnancy weight. Experts agree that what you weigh before pregnancy is the best indicator of how much weight you should gain during pregnancy. In addition, if you’re shorter than 5'2" tall, try to gain at the lower end of your weight range. Statistics show nearly 45% of all pregnant women gain more weight than they should. If you do, your risk of problems goes up. You also put your baby at risk. And your child has a much higher risk of being overweight by age 7. Many experts call for a weightgain figure of ⅔ of a pound (10 ounces) a week until 20 weeks, then 1 pound a week from 20 to 40 weeks. Other researchers have set up weight-gain guidelines for underweight, normal weight, overweight and obese women. Nearly half of all women who get pregnant have had a weight problem before pregnancy. You shouldn’t diet while you’re pregnant, but that doesn’t mean you shouldn’t watch what you eat. You should! Your baby will get proper nutrition from the foods you eat. Research shows if you dieted a lot before pregnancy, you may gain more weight than recommended during pregnancy, so pay strict attention to your eating plan. Choose foods for the nutrition they provide for you and your growing baby. Watch your stress levels, and try not to get too tired. If you’re stressed, fatigued or anxious, you may eat more fats, sweets and junk-food snacks. This can lead to an unhealthy amount of weight gain during pregnancy. If you want to breastfeed, gaining more weight than you should may contribute to breastfeeding problems. The extra weight may also delay your milk from coming in. If you have any questions, discuss them with your healthcare provider. He or she can advise you on how much weight you should gain during your pregnancy. In a normal pregnancy, fertilization occurs in the Fallopian tube and the fertilized egg travels through the tube to the uterus. There it implants on the cavity wall. An ectopic pregnancy occurs in the first 12 weeks of pregnancy when the egg implants outside the uterine cavity, usually in the tube. Ninety-five percent of all ectopic pregnancies occur in the Fallopian tube (hence the term tubal pregnancy). We have seen the number of ectopic pregnancies almost triple since 1985. Today about 7 in every 1000 pregnancies is ectopic. The reason for the increase? Researchers believe STDs (sexually transmitted diseases) are the cause, especially chlamydia and gonorrhea. If you have had an STD, tell your healthcare provider at your first prenatal visit. And be sure to tell him or her if you have had a previous ectopic pregnancy; there’s a 12% chance it will happen again. Chances of having an ectopic pregnancy increase with damage to the Fallopian tubes from pelvic inflammatory disease (PID), other infections, infertility, endometriosis and tubal or abdominal surgery. Smoking, exposure to DES (diethylstilbestrol) during your mother’s pregnancy and being older may also increase your risk. Use of an IUD also increases the chance of ectopic pregnancy. Diagnosing Ectopic Pregnancy. To test for ectopic pregnancy, human chorionic gonadotropin is measured. The test is called a quantitative HCG. The level of HCG increases rapidly in a normal pregnancy and doubles in value about every 2 days. If HCG levels do not increase as they should, an ectopic pregnancy is suspected. Ultrasound testing is helpful. An ectopic pregnancy may be visible in the tube. Blood may be seen in the abdomen. We are better able to diagnose ectopic pregnancy with laparoscopy. Tiny incisions are made in the area of the bellybutton and in the lower-abdomen area. Healthcare providers look inside the abdomen at the pelvic organs with a small instrument called a laparoscope. They can see an ectopic pregnancy if one is present. 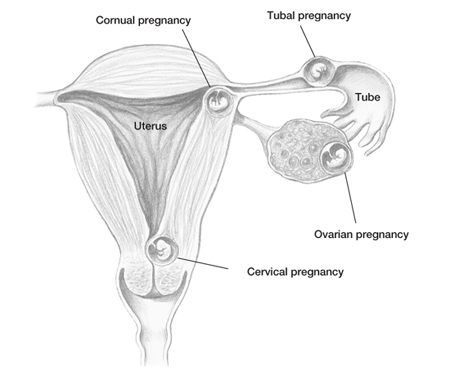 It’s best to diagnose a tubal pregnancy before it ruptures and damages the tube. This could make it necessary to remove the entire tube. Early diagnosis also tries to avoid the risk of internal bleeding from a ruptured tube. You may be a happier camper if you help out around the house more during your partner’s pregnancy. It can make your life and hers easier if you pitch in to do some of the shopping and household chores. Making your home safe for her also makes it safe for your baby. Possible locations of an ectopic pregnancy. Most ectopic pregnancies are detected around 6 to 8 weeks of pregnancy. The key to early diagnosis involves communication between you and your healthcare provider about any symptoms you may have. Treatment for Ectopic Pregnancy. The goal is to remove the pregnancy while maintaining fertility. Surgery requires general anesthesia, laparoscopy or laparotomy (a larger incision and no scope) and recovery from surgery. In many instances, the Fallopian tube may need to be removed, which may affect future fertility. A nonsurgical treatment involves the use of a cancer drug, methotrexate. It is given by I.V. in the hospital or at an outpatient clinic. Methotrexate ends the pregnancy. HCG levels should decrease after this treatment, and symptoms should improve. If methotrexate is used to treat an ectopic pregnancy, a couple should wait at least 3 months before trying to conceive again. Lightly grasp the back of a chair or a counter for balance. Stand with your feet shoulder-width apart. Keep your body weight over your heels and your torso erect. Bend your knees, and lower your torso in a squatting position. Don’t round your back. 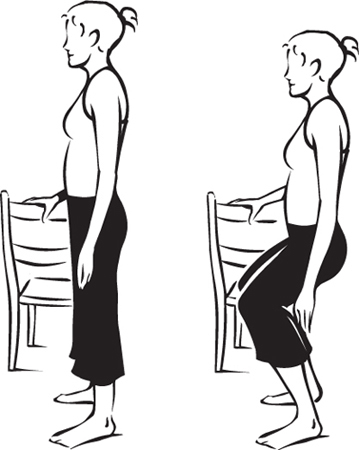 Hold the squatting position for 5 seconds, then straighten to starting position. Start with 5 repetitions and work up to 10. Strengthens hip, thigh and buttocks muscles.